As a world leader in financial services, construction, real estate, tourism, and energy, Dubai has become a shining business hub on the Arabian Peninsula. Home to thousands of the world’s most successful businesses, Dubai has become a place not only to work, but to relax and play. 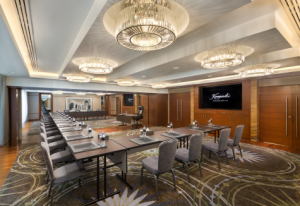 Whether you’re organizing an event for a corporate function, or are arranging a special birthday party or family gathering, Fluidmeet can help you to find banquet halls in Dubai to suit any occasion. It doesn’t matter how big or small your event will be, you still want your guests to be as comfortable, and as well catered for as is possible. Our location partners have been painstakingly chosen to ensure that we only connect you with the best facilities, in all of the right locations. A corporate awards ceremony, or a graduation party for family and friends, the locations you find on Fluidmeet are modern, clean, exceptionally well maintained, and can include as many, or as few amenities as you need for your gathering. The banquet halls on Fluidmeet are in some of the most prestigious establishments, allowing for you to make an elegant splash with your next party. Everybody has different requirements. From corporate awards evenings, to fundraising dinner parties, events in Dubai are exciting, dynamic, and always personalized. Because we understand that you may wish to bring in your own caterers, or bring catering from offsite, we can help you to find halls with attached kitchen facilities and preparation areas. If you need a small reception hall along with the main room, then talk to us about it. No matter what your special request is, Fluidmeet strives to provide the best, and most comprehensive range of banquet halls in Dubai. Make your next event one to remember, with Fluidmeet and the finest selection of Banquet Halls in the Emirates.